The National Academy of Medicine estimates that 40 percent of Americans live with chronic illness; approximately 50 million have an autoimmune disease. These figures may be underreported since many do not disclose owing to the stigma of illness. These 36 titles might help to relieve the pain of sufferers. "What does it mean for patients that the definition of chronic illness is fairly static but its scope has changed so much?” asks Laurie Edwards (In the Kingdom of the Sick). The definition typically refers to an illness that lasts three months or more; health community The Mighty expands upon this, calling it “a disease that is persistent in its effects or…comes with time.” Chronic conditions can be invisible or less visible illnesses such as lifelong autoimmune disorders rheumatoid arthritis, lupus, multiple sclerosis, and Crohn’s disease, among others. They can also refer to ongoing conditions such as fibro­myalgia and endometriosis. There is a common misconception that illness is an unfortunate but rare experience. For many people, chronic conditions do not go away and involve managing unpredictable symptoms. The National Academy of Medicine estimates that 40 percent of Americans live with chronic illness; approximately 50 million have an autoimmune disease according to the American Autoimmune Related Diseases Association. These figures may be underreported since many do not disclose owing to stigma. The antihealth and antiscience policy stances of the current administration mean statistics from government websites may also be ­under­reported. Women are more likely to have multiple chronic conditions; ones that disproportionately affect them, such as autoimmune disorders, are underresearched, explains Maya Dusenbery (Doing Harm). Both the stigma surrounding chronic ailments and the long history of doctors dismissing the concerns of their patients profoundly impact women of color. There is disagreement among medical professionals over whether cancer is a chronic illness since some types of cancer are curable. The following resources relate to conditions that are treatable but incurable. The medical system prioritizes mortality over morbidity, Dusenbery explains, and disability owing to illness is not uncommon, though not all who have chronic illness identify as disabled. Likewise, not all who have a disability experience illness. In 2003, advocate Christine Miserandino developed the “spoon theory” of communicating about chronic illness, referring to how much energy one has on a given day. Since then, spoonie has become a common self-identifier for those with chronic illness. While there are spoonie communities online, books can present a challenge for libraries as collection development policies often recommend weeding health materials after one or two years. Titles on medical marijuana, which are not listed here (see Max Macias’s “Cannabis Literacy,” BackTalk, LJ 2/1/18, p. 20), are another concern as laws vary by state and are often changing. In addition to the works listed here, it is worthwhile to browse small presses, medical publishers, and the websites of condition-specific organizations (e.g., Endometriosis Foundation of America) for additional materials. Unfortunately, not all health concerns receive equal funding or attention or have dedicated agencies raising awareness. As a result, libraries play a critical role in providing health literacy to their communities. Edwards, Laurie. 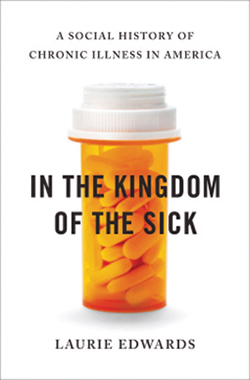 In the Kingdom of the Sick: A Social History of Chronic Illness in America. Bloomsbury. 2014. 256p. notes. bibliog. index. ISBN 9780802718013. $26; pap. ISBN 9781620406281. $16; ebk. ISBN 9780802778277. Friedman, Karen A. & Sara L. Merwin. The Informed Patient: A Complete Guide to a Hospital Stay. ILR. 2017. 248p. index. ISBN 9781501709951. pap. $19.95; ebk. ISBN 9781501714078. Doctors Friedman and Merwin make medical terminology accessible, demystifying common terms and acronyms used by medical professionals. The result is helpful preparation for a hospital stay or even an appointment with a new practitioner. Gawande, Atul. Being Mortal: Medicine and What Matters in the End. Metropolitan: Holt. 2014. 304p. notes. bibliog. ISBN 9780805095159. $26; pap. ISBN 9781250076229 $17; ebk. ISBN 9781627790550. Surgeon Gawande’s best seller looks at the links among medicine, public health, and aging. In examining elder care in the United States, he worries about the lack of physicians trained in geriatrics, especially as people experience illness for longer periods of time. Sontag, Susan. Illness as Metaphor and AIDS and Its Metaphors. Picador. 2001. 192p. ISBN 9780312420130. pap. $16; ebk. ISBN 9781466853560. First published in 1978, this classic remains relevant and often cited. Initially reflecting on tuberculosis and cancer, novelist Sontag states that illness is often romanticized, leading to dual citizenship in the kingdom of the well and the sick. Taylor, Sunaura. Beasts of Burden: Animal and Disability Liberation. New Pr. 2017. 272p. ISBN 9781620971284. $25.95; ebk. ISBN 9781620971291. Blending science and social commentary, Taylor shows how the social construct of disability shifted from a moral and spiritual issue into a medical one, while also reflecting on the historical roots of both illness and disability in humans and animals. Bernhard, Toni. How To Be Sick: A Buddhist-Inspired Guide for the Chronically Ill and Their Caregivers. 2d ed. Wisdom. Sept. 2018. 256p. bibliog. index. ISBN 9781614294788. pap. $17.95; ebk. ISBN 9781614295037. Inspired by the teachings of Buddhist writers such as Thích Nhât Hanh and Pema Chödrön, Bernhard applies the concept of impermanence to chronic conditions, acknowledging that the day-to-day is unpredictable and teaching the value of acceptance. Bernhard, Toni. How To Live Well with Chronic Pain and Illness: A Mindful Guide. Wisdom. 2015. 352p. ISBN 9781614292487. pap. $16.95; ebk. ISBN 9781614292630. Foster, Jeff. The Way of Rest: Finding the Courage To Hold Everything in Love. Sounds True. 2016. 352p. ISBN 9781622037919. pap. $18.95; ebk. ISBN 9781622037926. Jacqueline, Ilana. Surviving and Thriving with an Invisible Chronic Illness: How To Stay Sane and Live One Step Ahead of Your Symptoms. New Harbinger. Mar. 2018. 208p. bibliog. ISBN 9781626255999. pap. $16.95; ebk. ISBN 9781626256019. Starting with creating an elevator pitch for your illness, popular blogger Jacqueline offers tips on overcoming shame, building a support system, developing a health-care team, and requesting accommodations at school or work. Especially beneficial for those with autoimmune disorders. Pogrebin, Letty Cottin. How To Be a Friend to a Friend Who’s Sick. PublicAffairs. 2014. 304p. index. ISBN 9781610392839. $24; pap. ISBN 9781610393744. $15.99; ebk. ISBN 9781610392846. In this straightforward guide to illness etiquette, Pogrebin presents practical advice for friends and caregivers of those with health concerns, adding that people often feel “dis-ease about disease.” The ultimate message is one of empathy and availability. Selak, Joy H. & Steven S. Overman. You Don't Look Sick! : Living Well With Chronic Invisible Illness. 2nd ed. 2012. 170p. Demos Medical Publishing. pap. ISBN 9781936303427. $16.95; ebk. ISBN 9781617051388. Selak collaborates with physician Overman to create the book she could not find, but wanted to read. In alternating chapters with Overman’s reflections, she writes openly about grieving life before being diagnosed with fibromyalgia, along with positively coping with limitations. Shockley, Sarah Anne. 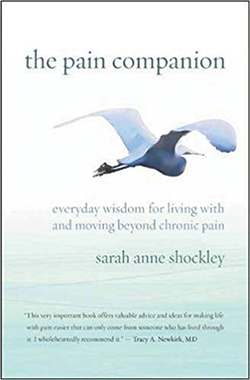 The Pain Companion: Everyday Wisdom for Living with and Moving Beyond Chronic Pain. New World Library. Jun. 2018. 192p. ISBN 9781608685707. pap. $15.95; ebk. ISBN 9781608685714. Shockley writes the companion text she wishes she had after being diagnosed with thoracic outlet syndrome. By focusing on emotional, as opposed to physical, states of pain—loss, grief, shame, terror—she provides an invaluable primer on making lifelong healing choices. Donlan, Christian. The Inward Empire: Mapping the Wilds of Mortality and Fatherhood. Little, Brown. Jun. 2018. 336p. notes. bibliog. ISBN 9780316509367. $27; ebk. ISBN 9780316509350. Duffy, Karen. Backbone: Living with Chronic Pain Without Turning into One. Arcade: Little, Brown. 2017. 252p. illus. ISBN 9781628727951. $22.99; ebk. ISBN 9781628727968. Eichenwald, Kurt. A Mind Unraveled: A Memoir. Ballantine. Oct. 2018. 416p. 9780399593628. $28; ebk. ISBN 9780399593635. Fitzmaurice, Simon. It’s Not Yet Dark: A Memoir. Houghton Harcourt. 2017. 176p. ISBN 9781328916716. $23; pap. ISBN 9781328508270. $14.99; ebk. ISBN 9781328918581. Khakpour, Porochista. Sick: A Memoir. Harper Perennial. Jun. 2018. 272p. ISBN 9780062428738. pap. $15.99; ebk. ISBN 9780062428721. Stopp, Victoria. Hurting like Hell, Living with Gusto: My Battle with Chronic Pain. McFarland. Jan. 2018. 171p. index. ISBN 9781476669908. pap. $29.95; ebk. ISBN 9781476630908. From navigating appointments to reconnecting with her love of running and backpacking, Stopp shares living with chronic neck and back pain after being injured at work; essential for anyone experiencing pain at a young age. Bodies of Truth: Personal Narratives on Illness, Disability, and Medicine. Univ. of Nebraska. Jan. 2019. 210p. ed by. Dinty W. Moore & others. ISBN. 9781496203601. $19.95; ebk. ISBN 9781496212658. Nature, Love, Medicine: Essays on Wildness and Wellness. Torrey House. Nov. 2017. 270p. ed. by Thomas Lowe Fleischner. pap. IBSN 9781937226770. $18.95; ebk. ISBN 978193722678. Dunlap-Shohl, Peter. My Degeneration: A Journey Through Parkinson’s. Penn State Univ. 2015. 106p. illus. ISBN 9780271071022. pap. $29.95. Knight, Paula. The Facts of Life. Penn State Univ. 2017. 190p. illus. ISBN 9780271078465. pap. $24.95. Knight traces her life through poignant images, from her idyllic childhood to the stigma of chronic illness and miscarriages. From biography to sociology, Knight limns the complex connections between motherhood (or lack thereof) and identity. Moss, Marissa. 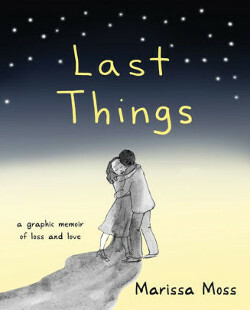 Last Things: A Graphic Memoir of Loss and Love. Conari. 2017. 184p. illus. ISBN 9781573246989. pap. $18.95; ebk. ISBN 9781633410596. Porcellino, John. The Hospital Suite. Drawn & Quarterly. 2014. 250p. illus. ISBN 9781770461642. pap. $22.95. Bula, Ania. Young, Sick, and Invisible: A Skeptic’s Journey with Chronic Illness. Pitchstone. 2016. 208p. ISBN 9781634310734. pap. $14.95; ebk. ISBN 9781634310741. In several short chapters, Bula, who lives with psoriatic arthritis and Crohn’s disease, explains what it is like to rely on a mobility aid at a young age. She honestly discusses being ignored by doctors and struggling with worthiness and ­worthlessness. Dusenbery, Maya. 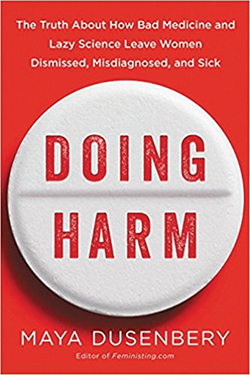 Doing Harm: The Truth About How Bad Medicine and Lazy Science Leave Women Dismissed, Misdiagnosed, and Sick. HarperOne. Mar. 2018. 400p. notes. index. ISBN 9780062470805. $27.99; pap. ISBN 9780062470836. $17.99; ebk. ISBN 9780062470812. Hirsch, Michele Lent. Invisible: How Young Women with Serious Health Issues Navigate Work, Relationships, and the Pressure To Seem Just Fine. Beacon. 2018. 216p. notes. index. ISBN 9780807023952. $26.95; pap. ISBN 9780807029817. $16; ebk. ISBN 9780807023969. Horn, Danea. Chronic Resilience: 10 Sanity-Saving Strategies for Women Coping with the Stress of Illness. Conari. 2013. 256p. bibliog. ISBN 9781573245944. pap. $17.95; ebk. ISBN 9781609258184. Horn writes a much-needed guide to answer the question, Why me? Interviews with women living with rheumatoid arthritis, Cushing’s disease, Crohn’s disease, and other conditions illuminate tasks such as creating a health binder and preparing for hospital visits. Huber, Sonya. Pain Woman Takes Your Keys, and Other Essays from a Nervous System. Univ. of Nebraska. Mar. 2017. 204p. ISBN. 9780803299917. $19.95; ebk. ISBN 9781496200839. With lyrical, memorable writing, Huber describes her pain adventure with rheumatoid disease; at once a chronic illness, autoimmune disorder, and invisible disability: "We are unbreakable in our brokenness. We cannot be cured and are therefore invincible." Norman, Abby. Ask Me About My Uterus: A Quest To Make Doctors Believe in Women’s Pain. Nation. Mar. 2018. 288p. notes. ISBN 9781568585819. $27; pap. ISBN 9781568589411. $16.99; ebk. ISBN 9781568585826. Center for the Study of Chronic Illness and Disability (CCID). Based in the College of Health and Human Services at George Mason University, with up-to-date health research. Clue Android & iOS. Free. This wide-ranging app tracks menstruation, fatigue, sleep, pain, and more. With health info in English and Spanish. Endo What? 55 min. Shannon Cohn, www.endowhat.com. 2017. DVD $19.99; digital download $14.99; streaming $5.99. Women living with endometriosis and their doctors show how women’s pain is common and often invisible to others. Medisafe. Android & iOS. Free. This simple app helps organize medication and supplement schedules. Popular health community The Mighty features background data on several conditions and shares personal narratives. Unrest. 90 min. Jennifer Brea, www.unrest.film/store. DVD & Blu-ray. $19.99; public performance $250; acad. libs. $350. Brea’s award-winning documentary depicts life with myalgic encephalomyelitis/chronic fatigue syndrome (ME/CFS). In this documentary series, Allison ­Behringer interviews women solving medical mysteries about their bodies. Advocate Cara Gael O’Regan provides health literacy about little-known conditions that primarily affect women. The life of rapper Prodigy and how living with sickle cell anemia influenced his music. Stephanie Sendaula (ssendaula@mediasourceinc.com) is an Associate Editor at Library Journal. Kiera Parrott the reviews director for School Library Journal and Library Journal and a former children's librarian. Her favorite books are ones that make her cry or snort on public transportation.